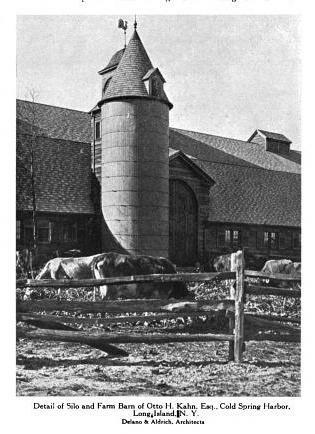 The farm group to 'Oheka', the Otto Hermann Kahn estate designed by Delano & Aldrich c. 1916 in Cold Spring Harbor. Click HERE and HERE for more on 'Oheka'. 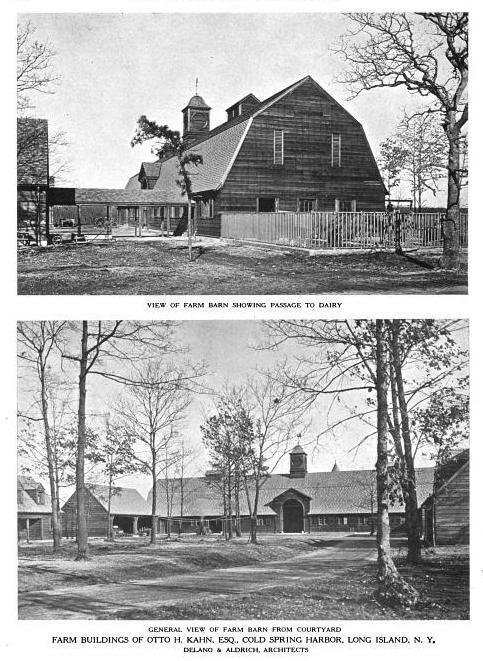 Click HERE to see the extant stable building on google earth and HERE on bing. Thank you so much of those amazing photos of Oak Knoll. It's good to see that the estate still is well maintained. Do you know what film Fairbanks was filming there? Good old Delano & Aldrich. 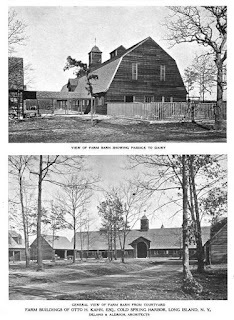 Absolutely flawless sense of proportion and fitness---they knew when to take it up a notch, and when to take down, as with these barns--rustic with style. Now I'm off to see the Oak Knoll pictures. I thought I read here that Oak Knoll was up for sale or going to be subdivided or some such....I am so happy to see that that is not the case. Such a beautiful home and garden. I hope it stays that way for a long, long time. Marvelous photos. Is that Mrs. Post I spy in 'family100', wearing one of her famous sheared pink minks? But more seriously: I was admiring the garage building in the aerial photograph, with its clocktower, and remembered out of the blue that there was once a wonderful Ralph Lauren spread, shot by Bruce Weber, I think, all taken at Oak Knoll, with shots in front of garage--marvelous building. BT, Do you know what happened to the original entrance gates? They were quite large, beautifully designed and were intact up through the 1980's but were removed at some point when the lower entrance courtyard was renovated. There now is a samll electronic security gate/intercom installed within the lower courtyard at the base of the driveway. Anonymous 10:48---I recognize many of these photos as ones used when the house was published for sale in a lavish coffee table real estate book some years back--not current, in other words (BT emphasizes they are from 80 and 95). I've heard, in the forum here, I think, there there is something--for sale, foreclosure, something--going on. If one were to pick the ten country houses of its era that should be preserved for perpetuity, this is high on the list. as far as what happened to the gates, which my father had installed do not know. I'm somewhat late to this party but BT...wonderful photos. The aerials are really killer. Thanks for sharing. I've always loved Oak Knoll. I always pass by on my way to my cousins house. Would love to see a photo of the gates that were spoken off. Kind of off-topic; But was Shore Road always there, or did that come much later on? It seems that some estates would have gone down right to the water, but then there are other estates that Shore Road seems to be the entrance point...any clue? Thanks so much for access to the Oak Knoll photos. What a wonderful place! In the aerial photo is the circular shape a swimming pool? BT...I hope you've had an opportunity to check out all my previous postings on the Winthrop D&A commissions in Muttontown. As I understand it West Shore road does indeed predate the building of Oak Knoll. It's long been the artery connecting Oyster Bay with Centre Island/ Bayville. Before automobiles it was trafficked by local farmers and wagons from the Centre Island brick works.